Gamedayplus is a new video magazine that focuses on some of the biggest stars in the world of football. The series will run as warm up for the Champions League rounds, and this week we meet Leo Messi, André Schürrle and Aubrey Dolan, who is a part of the adidas Innovation Team. Check out the episode right here. When it comes to club football, it doesn't get much bigger than participating in the Champions League. The tournament has given us some of the most memorable moments in European football; and most football fans have surely dreamt about standing on the pitch while the iconic Champions League anthem is sounding. In the second episode of the adidas Gamedayplus series we meet Leo Messi, who naturally doesn't need further introduction. Here, Messi speaks of, among other things, Barcelona's impressive offence, which includes quite the trio with the three musketeers of South America: Messi, Neymar and Suarez. In a months time they will have the chance to prove what they can do together on the pitch, something that we certainly be exciting to follow. Join the Champions League fever with the new f50 Messi Blaugrana right here. André Schürrle also got to sit in the hot seat, as we has asked about his flourishing career, and also how it feels to follow in the footsteps of Michael Ballack. He reveals how he and Ballack often talk, and how we owes Ballack a big thanks for the role he has played in connection with Schürrle, both as an idol, team mate and a friend. Get your hands on the Chelsea shirt right here, maybe with Schürrle on the back. 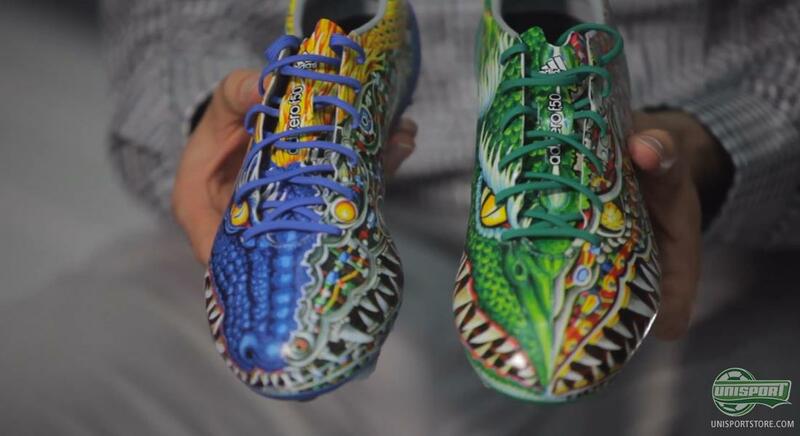 Last but absolutely not least, we meet Aubrey Dolan who tells a bit about how and why the newly launched f50 adizero Yamamoto was created. First of all, it is the wish to stand out that has brought adidas and Yamamoto together. The boots were launched together with the Real Madrid dragon inspired third shirt. Lately we have also seen James Rodriguez, Gareth Bale and Marcelo, among others, wearing the Yamamoto for training; and the question is if we are actually gonna see these players wearing it in a match? The f50 Yamamoto is unfortunately sold out, but you can find many other models right here. Adidas Gamedayplus gets you ready for the Champions League matches and for next round we will meet Gerrard, Bale and Schweinsteiger for exclusive interviews and behind the scenes clips. Who would you rather interview?